We live in a world where those who are honoured are the sowers of discord and the reapers of mayhem, the state sponsored agents of chaos. We no longer honour the true heroes, we honour an illusion called power and greed. The state media apparatuses serve only to keep historic Fitna (sedition) wounds festering and the “NGO complex” pied piper plays the tune of stake-holding in human suffering, created in advance by the Empire’s composers of death. 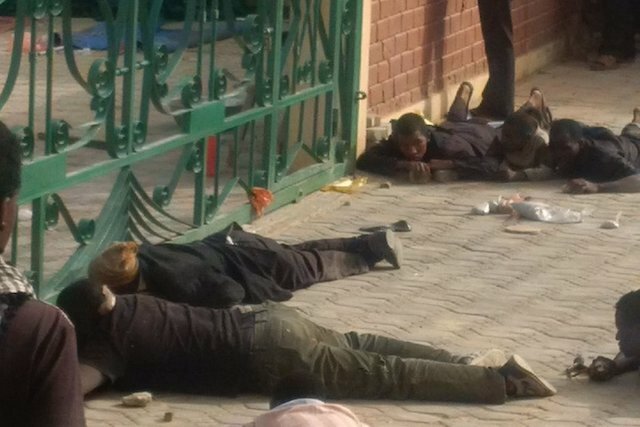 If indeed, this were a simple fracas over “right of way on a public highway” which resulted in the shooting of unarmed Muslims, why then did the same Nigerian government armed forces attack Hussainiyah, the sect’s headquarters later the same evening, hours after the initial clashes? Why did they deliberately target high ranking members of the Shi’ite Islamic movement and execute Hamad Zakaky, son of the movement leader Sheikh Ebrahim Zakzaky. Why did they attack and wound the Sheikh’s wife, Zeenat? Why did they shoot the Sheikh himself, four times in his hands, publicly humiliate and arrest him? Why, if this was not a premediated act of aggression and suppression, had the Army ensured the presence of camera teams at both attacks and why were women and children not spared the murderous hail of bullets? To more fully understand this violent targeting of the Sheikh and the Islamic Movement, we must take into consideration, both the historical and more recent influences upon Nigeria. China has been an evolving partnership in Nigeria, investing heavily in the development of infrastructure and fixed assets, refineries and factories. In a role diametrically opposed to the traditional plundering partnerships of the US and other neo-colonialists with sovereign nations, China contrarily seems to have a genuinely vested interest in the stability of Nigeria to support a mutually beneficial economic and trade relationship reliant upon the growth and profitability of Nigeria itself. It is logical, rational and reasonable to speculate that Boko Haram is effectively another terrorist trade name, brought into existence, to destabilize a region that is daring to jailbreak from US colonialism and to explore alternative bi-lateral trade pathways that deviate from the US regional “road maps”. It successfully elevates the Nigerian army to defender of the “meek” against the “terror” threat and provides cover for any violent opposition suppression. “We know the names of the contractors and those contracted to commit the massacre, their identity is not hidden from us. Therefore we cannot be cowed by an imaginary Boko Haram tale, let them tell it to the fools and ignorant. They should know that they are dealing with those with foresight, wisdom and intelligence, and above all with the real religion”. Grey Wolves, FSA, ISIS, DAESH, Al Qaeda, Khorasan, AQAP, Jabhat al Nusra and Boko Haram [to name a few], are they all nothing more than trade names, successfully managed brand images, logos and IDs all emanating from the US/NATO, Israel and Gulf State holders of the patent on terror and their associated marketing agents and concept creators? Sheikh Ebrahim Zakzaky also challenges another malevolent bastion of Nigeria’s landscape, the powerful pro- Israel lobby whose growth and expansion in Nigeria had been hugely facilitated by former President and Christian Zionist, Goodluck Johnathan. Nigeria is now home to Africa’s largest Israeli Jewish community [15, 000 in 2014]. These were Hamad’s last words to the world before the 12/12 bloodbath in Nigeria stripped one more son from the family of Sheikh Ebrahim Zakzaky, Hamad gave his young life in the service of peace & freedom. A life that was unrecognised by Western or even Palestinian media on the day he died. Into this maelstrom of lawless and Machiavellian meddling in Nigeria we can add one final component without which the neo-colonialist frontlines would not be complete: the Saudi Wahhabi agents of Islamic “change” who are the subterranean source of Muslim extremism and religious fanaticism; the funders and suppliers of the brand name proxy forces, deployed to whip up the “terror” frenzy wherever it is required to destabilize or unhinge unity that may jeopardize Empire’s intent. With ultimate irony, it is Riyadh that is self- appointed to combat the terrorism created in its image, by forming a coalition of 34 predominantly Muslim nations, Nigeria included, with the predictable exclusion of Iran, Syria and Iraq all of whom are involved in battling the Saudi NATO sourced terror hordes on the ground. In direct contrast with this deliberate policy of divide and conquer, Sheikh Ebrahim Zakzaky is a man of religious respect and tolerance, he embraces Christians, Sunnis and Sufis alike despite his Shia centric movement and its ties with Tehran, which naturally represents an additional and perceived monumental threat to US/NATO and Saudi/Israeli regional hegemony. The Western media silence over the Zaria massacre is indicative of their collusion in this mass killing of innocents and proof of the role they play in exacerbating global sectarian division at the behest of their Washington, Tel Aviv and Saudi donors and backers. This is a missed opportunity for the unity of peoples suffering from the same symptoms of neo colonialism, regardless of creed, sect or religion. Al Quds represents the identity, not only of Palestinians but of the entire Arab world. Those who defend it from Israeli occupation are those who are enduring their own form of occupation by the patented terror armies: Nigeria, Pakistan, Yemen, and Syria. As these nations unite behind Palestine to prise loose Israel’s jaws from the third most sacred site for the Muslim Ummah, Palestine is needed to unite behind those who give their lives for Palestine and thus for Humanity. It is this unity that will resolve the ancient theological disputes that are permitting the externally induced sectarian fault lines to widen and deepen. Leaders, visionaries, like Sheikh Ebrahim Zakzaky show us the way to a new world, one that is driven by justice and progress, dependent upon compassion, communication and unification. They show us that courage, universal respect & humility is needed to evade the dystopian future that is being forced upon us by the ruling elite. It is these men of integrity who resist corruption and maintain their morals and fundamental principles despite their own personal suffering and loss, that we should honour and aspire to emulate.